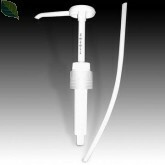 This Medium Duty 55 Gallon Siphon Style Siphon Drum Pump is perfectly suited to light duty dispensing of our Green Cleaning Solutions. Designed for effortless pumping from 15, 30, and 55 gallon drums, this siphon drum pump is made of polyethylene and PVC and can be used with drinking water, mild acids, light oils, water based fluids and other materials non-corrosive to polyethylene and PVC. (Do Not use with lacquer thinners.) Dispensing rate is up to 3 ounces per stroke or up to 5 gallons per minute. This pump can be used to either siphon cleaning solutions down to a lower level or pump them up to a higher level. Siphoning action is controlled by an air vent on top that can be used to stop the siphon by unscrewing it.